Sober Systems – The Recovery App! Nowadays, nobody goes anywhere without their smartphone. With emerging technology, we’ve seen the popularity of fitness apps explode. Now, medical apps are being used to monitor your general health, diabetes, heart and other conditions. Apps are a simple and affordable way to monitor and gather data, track progress of recovery and your ongoing health. So, what’s next? It’s an app that uses technology to help you with real-time addiction recovery, program compliance, behavioral modification and data-based reporting. SoberSystems® helps you build healthy habits, maintain compliance with recovery treatment and reach your wellness goals faster than you ever thought possible! SoberSystems®’ data-driven approach supports your clients’ recovery, while improving treatment compliance, lifestyle change and helping them achieve wellness-related goals. SoberSystems® lets clinicians stay engaged with their clients’ recovery, while providing an early indicator of relapse. The faster you identify issues, the quicker you can reengage and get them back on track. SoberSystems® can be easily customized for your agency’s specialty and branding. You’ll be able to provide the data-driven, well-documented support patients – and payers – demand. SoberSystems® reduces recidivism, boosts compliance and increases your bottom line as a cost-effective solution for the continuing care market. They’ll get sober – and stay sober! This is the recovery tool that will drive your success, while minimizing relapses and promoting compliance. It will have a direct beneficial impact on your bottom line. And because it’s mobile app driven, your cost of entry is low. SoberSystems was designed based on an extensive history of research and evaluation. We’ve identified the key triggers and turning points which lead to self-destruction and relapse. This app is specifically designed to guide behavioral change, encourage compliance, alert the client and his support team of relapse dangers. Our goal is simple - keep the client on the Road to Recovery. The Daily Check In is a series of six questions asking the user specific information about their daily commitment to recovery. The questions remain constant so consistency and self discipline develop, and then get strengthened as a preventative to relapse. The Reminders are pre-programmed general messages users can activate to ensure completion of goals or tasks. We want to ensure compliance while reducing the risk factors for relapse. These simple reminder can sometime make a crucial difference. This component is designed to provide Lifelines for the person who is at risk of relapse. When a client/user initiates an account, they are guided through the start up process, that includes providing critical lifelines that can be alerted before complete relapse. Communications are made via email. This component is designed to provide Lifelines for the person is at risk of relapse. When a client/user initiates an account, they are guided through the start up process, that includes providing critical lifelines that can be alerted before complete relapse. Communications are made via email. This feature links users to support group meetings information. Thousands of individuals who have actively engaged in recovery through these programs have remained abstinent from substance abuse for years to follow. The Sober Community is an unedited, unbiased social forum allowing people to voice views and locate support. Screens are simulated. Actual screens may vary. Do you have questions about SoberSystems? Contact us and let us give you more information. The Rewards Based Program that perfectly complements the SoberSystems Mobile App. Easily join our community by registering your name and email address. You’ll get access to our Unbiased, Un-Edited and - most importantly - Un-Affiliated community of like-minded people in recovery. Earn Sobercoin by merely sticking to the program. Use it for partner programs, services and much more. 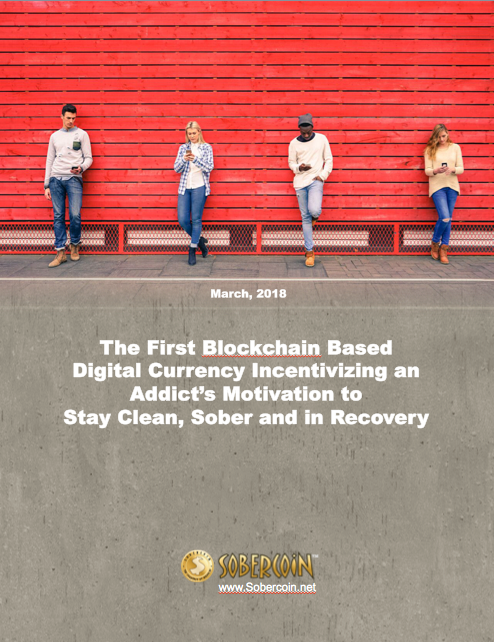 Sobercoin helps you Get Sober and Stay Sober. Some of Our Clients and Programs we have worked with.